It’s all over. The planning. The expectation. The excitement. The wedding. 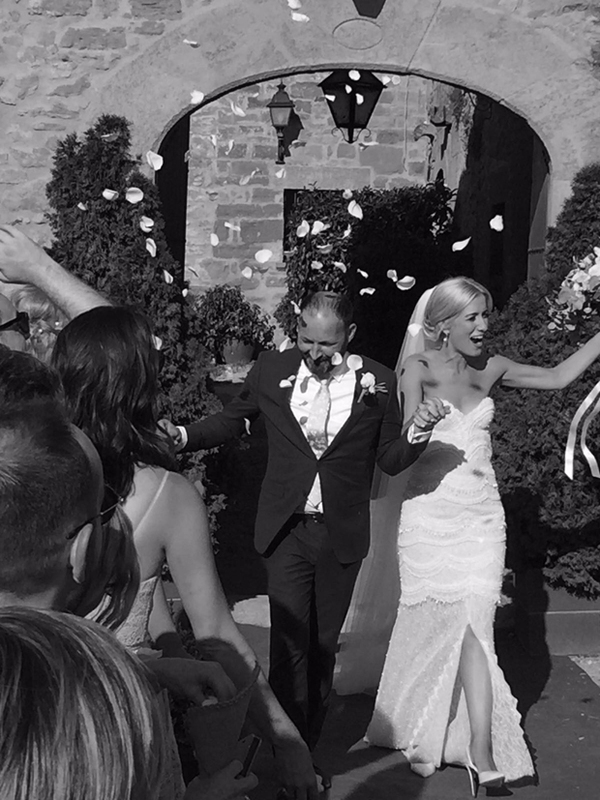 I’m here on the Cote D’Azur in the south of France, one week after my wedding, with my new husband and torn between two thoughts: one, wishing that I could go back and relive that magical day, and two, an almighty satisfaction that it was such a success. I have a new appreciation for everyone who works in this sector. Months and weeks of preparation don’t ready you for the emotional outpouring on ‘the most important day of your life’ but they do go a long way to making sure all the details are locked down so that you can experience it ‘in the moment’ and get to savour the magic. I guess that’s the payoff. Preparation, preparation and a bit more preparation means that on the day, your wedding experience is truly yours to enjoy. That’s how it was for us. If you’re planning your big day I wouldn’t underestimate the amount of time that goes into organising a wedding. But the good news is that it’s worth it. 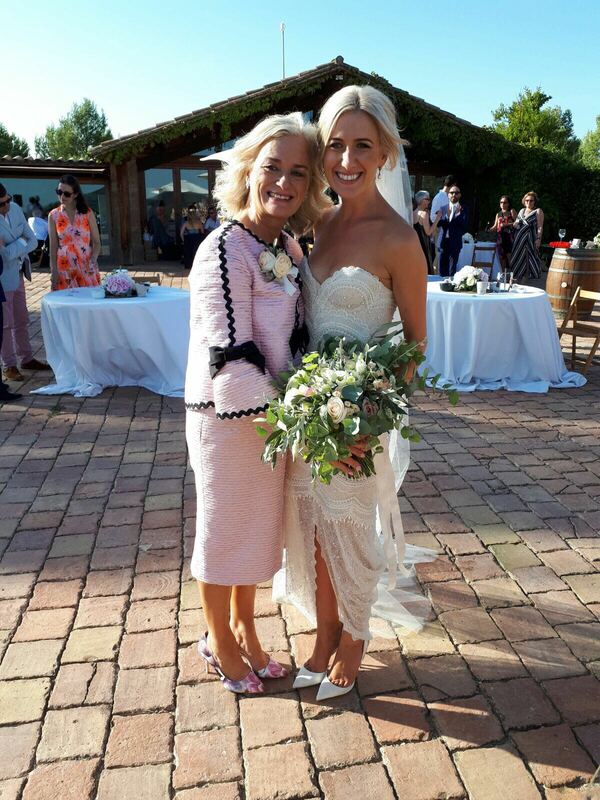 My wedding day became very real before I left for Spain when I went down to The Attic Bridalwear Boutique in Limerick to collect my wedding dress from designer Orlaith Carroll. I’d shown her pictures of dresses that I loved and asked her to come up with a design just right for me – she did. But what I wanted was a hand-beaded bespoke dress that would require hours of slow, painstaking work. For Orlaith and her lovely assistant Roisín, it was a challenge that they relished. It paid off. I loved wearing it throughout the day. When I eventually took it off at sunrise on the morning after my wedding day I shed a tear. It sounds silly but I’d never worn anything so perfect for me. Orlaith is an incredibly talented Irish designer and has a big future ahead of her. I’m glad and proud to have been part of that for one small moment. Not everything ran smoothly up to the wedding though. My bridesmaids were amazing on the day but things hadn’t gone smoothly with their dresses. I’d bought them online but once they tried them on, they were saggy, baggy and a mini-bridesmaid revolt was on the cards. The seamstresses of Letterkenny sorted that out – Gitana turned around three misshapen baby pink dresses into a trio of suave, slinky cocktail dresses suitable for a wedding. Sometimes it takes a bit of Donegal magic to make things happen! 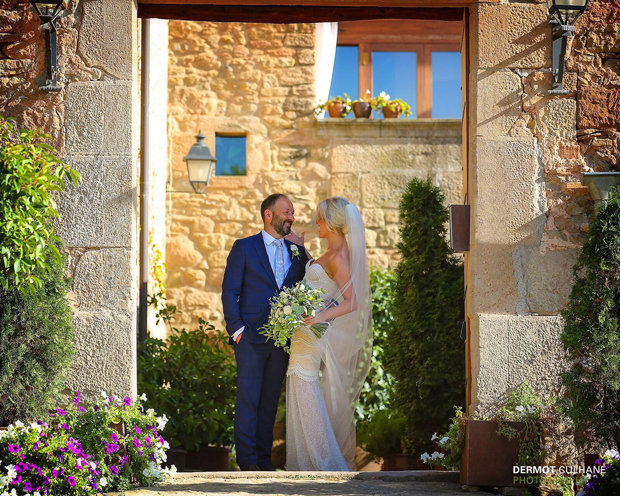 My husband and I got married on the 24th of August 2017 in our dream venue – La Garriga de Castelladral in the heart of Catelonia. I’d looked for months for the perfect venue and found this place in early February 2017. 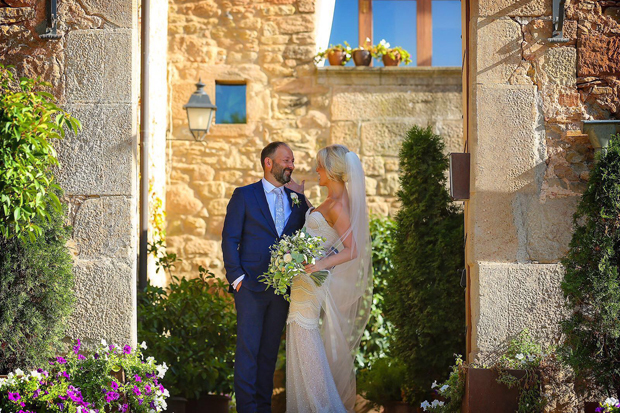 We flew direct to Barca with all our wedding gear and hired a car. By the time we checked in, almost six months later, La Garriga was at the height of its powers. The bougainvillea were blossoming, the Spanish sun was at its most powerful and the Montserrat mountain cast a protective silhouette in the distance. 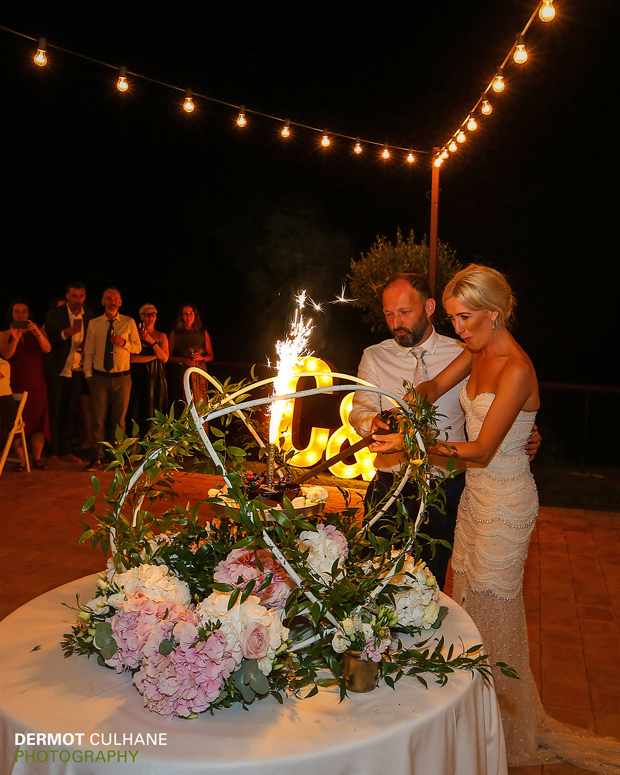 I had dreamt of an outdoor wedding – everything from the ceremony to late-night dancing. When we checked in, it looked like my dream was going to come true. 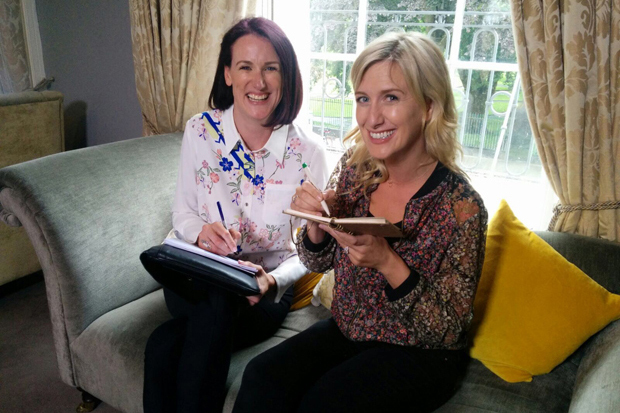 We had one day to ourselves to finalise plans with wedding planner Sharon Mc Meel before our first family guests started arriving and there would be no more time for jobs. One of those last jobs on our list before the wedding was to find a videographer – step forward Carl Higgins. I really wanted to record the wedding ceremony, the speeches and key events throughout the day for posterity. At short notice, Carl made himself available, came to Spain with his kit, drone and was a pleasure to deal with from start to finish. A true pro, he recorded every detail of the day without getting in the way. I’ve learnt that is a real skill – a sign of the true wedding pro. Carl is that person. That praise goes out to photographer Dermot Culhane also. Working in the media we actually wanted to hire someone we didn’t know personally, but had a reputation for delivering great images in reportage style. Dermot was a great professional and someone who delivers without imposing themselves on the proceedings too much. The results were fantastic. Dermot was a gentleman, genuinely enthusiastic for us and a pleasure to be around. He made posing for snaps seem like fun and 30 minutes after our ceremony we were free to join our guests for the real party! You can’t underestimate how important the attitude of photographers and videographers are on the big day – they shape your mood. Dermot and Carl were a pleasure. The walk up the aisle with my father and the whole ceremony was so overwhelming that I nearly missed the work from florist Josephine Higginbotham (Wedding Flowers by Josephine). Almost but not quite. 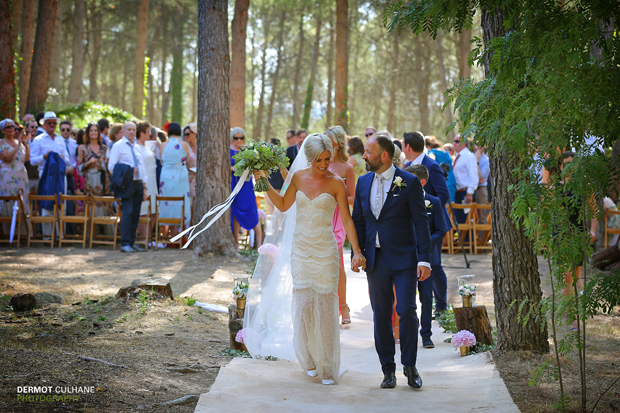 An eight foot high circle of flowers and leaves was the backdrop to proceedings, hung naturally between two trees. Rich and I love the outdoors – so it was vital to get this right. Josephine did – not only that but my bouquet, the aisle arrangements, the pinhole flowers and dinner arrangements were out-of-this-world. At one point my aunt pulled me aside and said ‘Can you just take a minute to appreciate these table arrangements? !’ She was right – they were stunning. Often the details that hold the day together get forgotten but not on this day. Josephine‘s work was stunning and was the continuum that linked the different stages of the day together. I don’t know if you’ve ever been to a classical concert with a virtuoso conductor but that’s what a good wedding planner does. They conduct the various elements of the crew, wedding party and different suppliers to optimum effect. Our wedding planner Sharon Mc Meel did that. All the time-consuming meetings, planning and phone-calls all come down to that one day. Sharon owned it, managed it and everything flowed through her to perfection. We could sit back and enjoy. The way it’s meant to be. One of our biggest loves is music so it’s no surprise that we laboured over music at the wedding more than any other element. 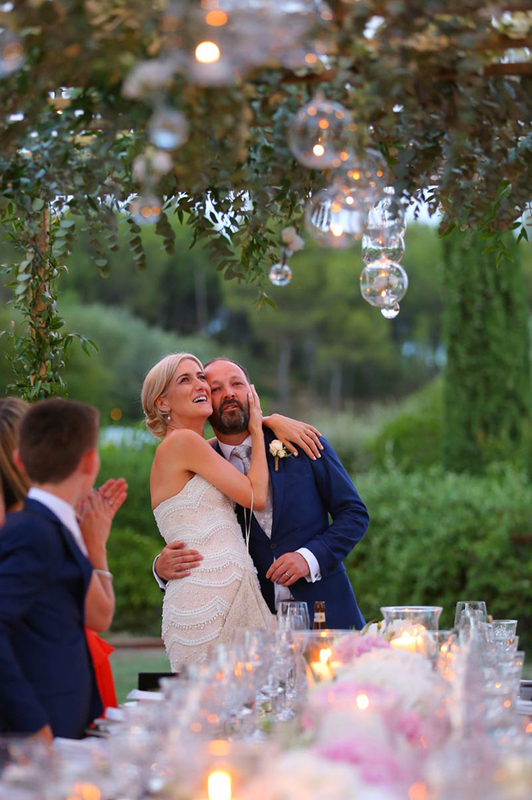 Rich and I both love Bluegrass so we scoured Spain and Catalonia looking for a suitable grouping for our reception. Step forward Lluis Garcia & the Barcelona Bluegrass Band. It’s a sign of a good wedding if the guests are dancing BEFORE dinner. These guys were out of this world – maestro musicians who played songs we requested but also Bluegrass staples and the odd swerveball – Motorheads ‘Ace of Spades’ anyone? Our main band – the ‘Funk Boss Bros.’ – were also excellent and provided multiple stand out moments of the night, not least our entire wedding party singing ‘Purple Rain’ – the long version – word for word with an excellent lead singer. And final thanks goes to our DJ – JJ Hartigan who also happens to work for 2FM. What a guy, he soaked up hundreds and hundreds of requests, never batted an eyelid but delivered a mix that managed to have every artist we asked for, all the notes we wanted to hit and stayed playing till 4.30am!!! In fact looking back we were dancing for nearly 8 hours throughout the day and night. No mean feat. 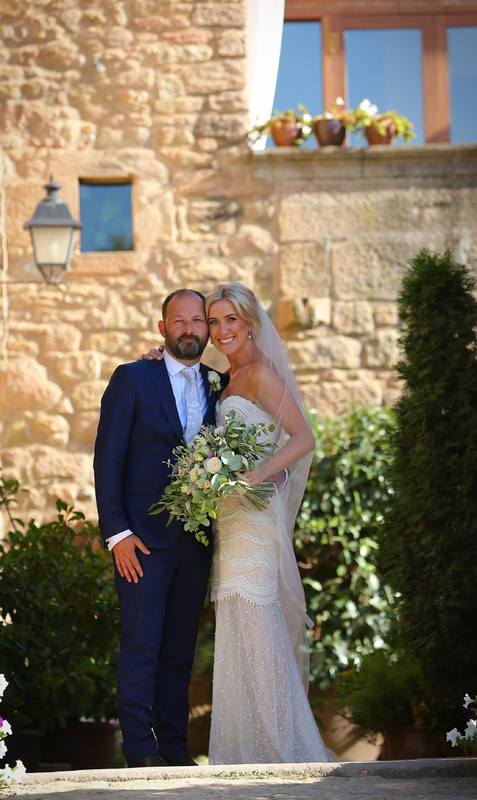 Every aspect of the day paid off – the ceremony was just the way we wanted, the music was perfect, the weather was just right, the venue, the atmosphere. Everything. But one element I think surpassed even our expectations – that was the food. All the food and cooking facilities had to be brought on site, so it was no small operation. Catering Sensacions run by proud Catalan Josep Carreras were out of this world. We had 90 minutes of tasting during the reception – everything from iced watermelon mojitos to salmon smoked on site! Our guests were blown away. The mains didn’t let up – our two options were duck and hake and every plate was wiped clean. They were also great value. 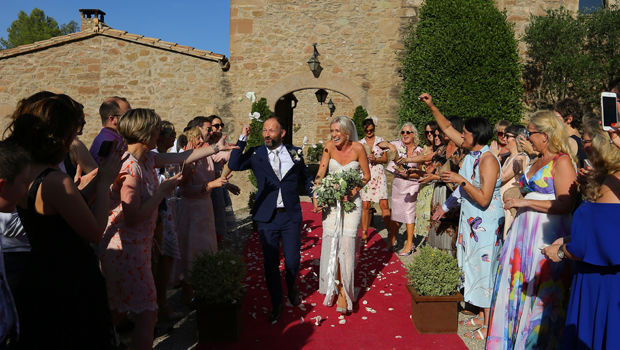 One of the benefits of a wedding in Spain or Catalonia is value when it comes to food and drink. We went for an all-in deal with an open bar till the small hours. I wouldn’t hesitate recommending Josep and Sensacions. The food and service was simply knock-out. I had wanted an overseas wedding with guaranteed sunshine. That comes with a lot more planning and more expense in travelling and accommodation for you and your guests. But the upside is that you have a great chance of having hot and sunny weather. You can plan to be outdoors. You can also get great value in the catering and drinks for your guests. And your guests feel like they are on holiday. Many of ours took a week off to travel around Catalonia, visit Barcelona and take time out. It means they were in holiday mood and in great spirits on the big day. I think the costs balance out but you are going to have a unique day in a unique location and create very special memories for the rest of your life. Don’t forget – the wedding is one day. The memories you keep with you forever.